Immediately after birth at Holloman Air Force Base on Nov. 23, 1983, Levi was taken from his mother. From the age of one year until almost 10 years, very little is known about Levi except that he tested positive for hepatitis C on March 8, 1993, Dec. 9, 1993, and March 14, 1994. Levi has experienced at least 67 anesthesia inductions over his lifetime, during which the anesthetics ketamine and telazol were used. From May 19, 1993, until April 28, 1995, Levi was enrolled in hepatitis studies requiring 46 separate anesthesia inductions with ketamine, liver and muscle biopsies, and serial blood sampling. On Feb. 27, 1995, Levi was bled seven times during 16 hours and required extra doses of ketamine to “keep him cooperative.” Muscle biopsies are usually conducted surgically, during which sections of the muscle are removed for pathology testing. Levi was administered Tylenol for the muscle biopsy pain, but Dr. Richardson notes that in his professional experience Tylenol alone would not provide the appropriate level of pain relief associated with muscle biopsies. On April 24, 2001, Levi’s medical file notes that he chipped his incisors from “chewing” on metal. Over the course of his life, Levi has suffered a number of traumatic injuries from his cage mates, including lacerations, a swollen eye, and other wounds. 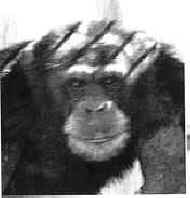 Dr. Richardson states that after decades of living in a laboratory “Levi’s present health status consisting of [high blood pressure and heart disease] places him at a greater risk of heart failure and sudden cardiac death than a normal healthy 28 year old chimpanzee.” His return to invasive experiments will further jeopardize his physical and psychological health.